For the longest time, I’ve been intrigued by two islands. The first is Keefer Island, a 600-foot-long blot of lava rock and sagebrush in Idaho’s Snake River, lying within the boundaries of the city of Idaho Falls. The island used to have a single willow tree, until wind pushed it down onto the cabin built by an early Idaho Falls denizen. The tree is gone. The cabin still stands. But I’ve never been there. The other is Utah’s Antelope Island. It sprawls over 42 square miles in the middle of the Great Salt Lake, with a short chain of mountains that pops out of the ground to loom 2,500 feet above the lake’s surface. Isolated by its surrounding salty moat, the island has often called to me to explore its plains and hills. And maybe provide a location to spot the Great Salt Lake’s mythical North Shore Monster. Now, thanks to Explorer Fishstyx, who gets around in Utah like nobody’s business, I know where to go to get to Antelope Island, and what to do when I get there. You can read about his adventures on the island here. This is what Uncharted is all about: Exploring the unexplored. Sure, lots of people have visited Antelope Island before Fishstyx. But it’s not until you’re there, breathing that salty air, stalking antelope with your camera and otherwise enjoying the solitude of that island fortress that you can nod sagely with the others and say, “Yup. I’ve been there.” Seeing Fishstyx’s photos and reading his story now cements it in my mind: I’m going to Antelope Island this summer if it kills me. And Keefer Island won’t be far behind. Now it’s up to you. 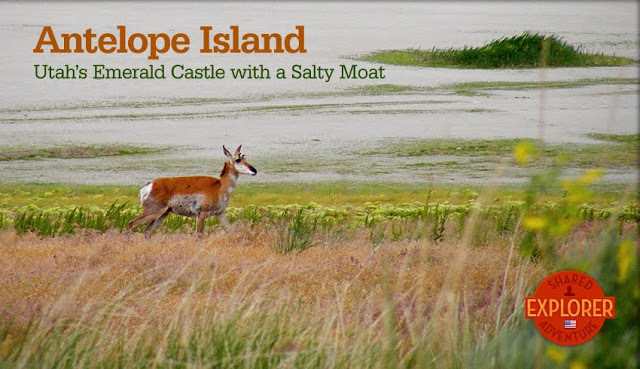 Have you visited Antelope Island? If so, we’d like to hear from you. Just because Fishstyx has published his story and photos, that doesn’t mean the book is closed on this adventure. Each one of us brings a different perspective, a different eye, to each place we visit. That’s what makes us explorers. And sharing our adventures at Uncharted — whether we’re the first or seventy-first to do so — is what matters.